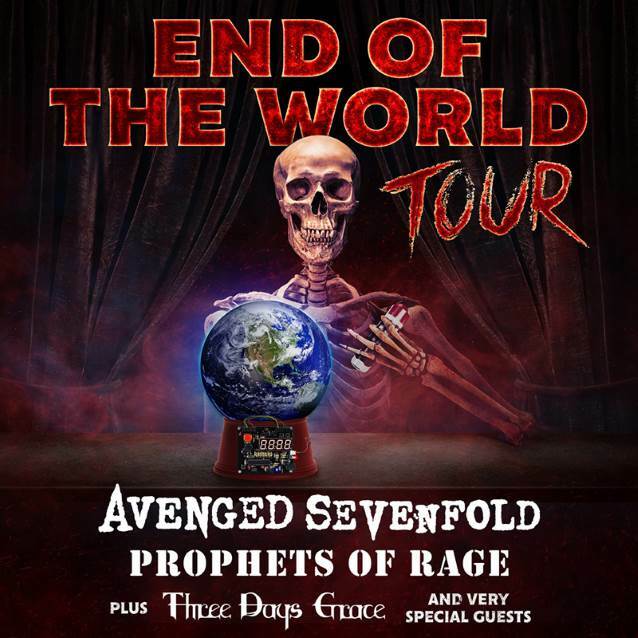 AVENGED SEVENFOLD has been forced to cancel its previously announced "End Of The World Tour" with PROPHETS OF RAGE. The trek — which was also slated to feature THREE DAYS GRACE — was scheduled to kick off July 22 in Mansfield, Massachusetts. AVENGED SEVENFOLD singer M. Shadows explained in a statement: "There is no good way to start out a note containing bad news, but here it is. "After Europe, I came down with a terrible viral infection that rendered me voiceless. "I tried my best to take care of the situation with voice rest, medication and doctor visits, but the voice was only getting worse. "After a week of steroids, the swelling went down enough to see the cause of the problem. 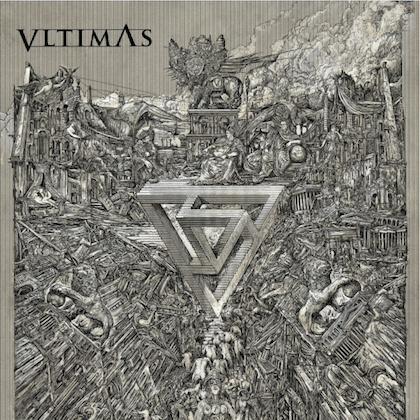 A blood blister has formed on my vocal folds and is preventing them from vibrating properly. In short, I can't sing anything at the moment and the more I attempt to, the more damage is being done. Luckily, as of now, the doctors feel that three months of no singing and voice rest should get my chords back on track. "Unfortunately, this means we will have to cancel all tour dates at the moment. "Decisions like this weigh on me very heavily. It's a tour I was looking forward to very much. "I want to apologize to the fans who have spent their time and money booking travel arrangements and accommodations. I also want to apologize to our crew and the other bands who were depending on this tour. "None of these things are lost on me. "Just know that I have exhausted every possible solution in trying to get out there and perform for you. It just simply can't happen at the moment. "We have a few things coming down the pipe soon that should be fun, so we hope you look out for those. "Again, I am deeply sorry and hope to see you all soon." 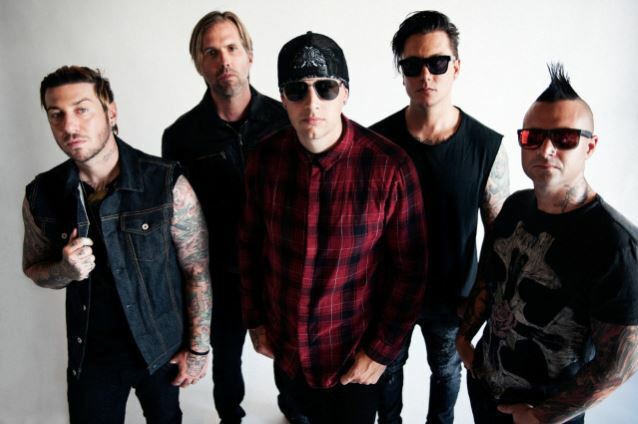 M. Shadows previously underwent vocal cord surgery more than 15 years ago, prior to the recording of AVENGED SEVENFOLD's 2005 album "City Of Evil". He later said that "it took a couple of years" for him to get all the lost notes from his voice, explaining in a 2016 interview: "I went from just being a kid that dropped out of high school to go on Warped Tour and had no training at all. And then when you come off a surgery, you have a lot of doctor's orders, which is don't talk for a couple of months and then go see this vocal coach. And so once I saw the vocal coach, I realized all the things I was doing wrong. But, you know, about six years stuff after that, I was able to get all my old stuff back, but with a little bit of technique so it doesn't hurt when you sing; it's not supposed to hurt when you sing. So I learned a lot from him and I still use him to this day." A deluxe edition of AVENGED SEVENFOLD's latest album, "The Stage", arrived in December, featuring seven additional studio songs plus four previously unreleased live tracks recorded during shows at the O2 Arena in London.